AbRam Khan made an appearance on the Mannat balcony and continued to wave to the waiting crowds just like his superstar dad. Dressed in a tee shirt, shorts and sandals, AbRam was then led inside by big sister Suhana who carried the tiny tot away. Bollywood superstar Shah Rukh Khan, who turned 50 on Monday (November 2) kept up with his yearly tradition and came out to meet fans at his residence in suburban Bandra. 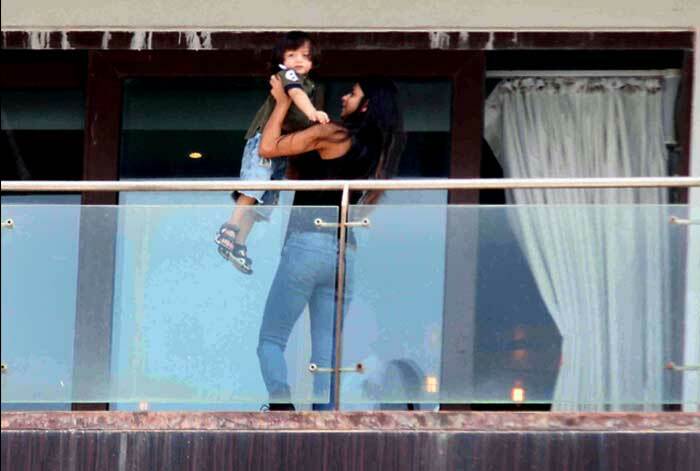 The actor was seen waving to fans from the balcony of Mannat with his youngest son AbRam in his arms. Seems like the toddler was quite taken with the crowds and the outpouring of love from his fans as he made an appearance on the balcony and continued to wave to the waiting crowds just like his superstar dad. Seems like AbRam is already quite the star! !